Chinese Foreign Minister Wang Yi announced on April 18 that the Belt and Road Forum for International Cooperation will be held in Beijing on May 14 and 15. The Belt and Road Forum for International Cooperation will be held from May 14 to 15 in Beijing and President Xi Jinping will attend the opening ceremony and host the round table summit of the leaders, Foreign Minister Wang Yi said yesterday. Xi has championed the “One Belt, One Road” initiative to build a new Silk Road linking Asia, Africa and Europe, a landmark program to invest billions of dollars in infrastructure projects. China has dedicated US$40 billion to a Silk Road Fund and the idea was the driving force behind the establishment of the US$50 billion Asian Infrastructure Investment Bank. Among those attending will be Russian President Vladimir Putin, Pakistani Prime Minister Nawaz Sharif and Cambodian Prime Minister Hun Sen.
Myanmar’s Aung San Suu Kyi, Kazakh President Nursultan Nazarbayev, Malaysian Prime Minister Najib Razak and Indonesian President Joko Widodo will also be attending the forum. British finance minister Philip Hammond will come as Prime Minister Theresa May’s representative, while Germany and France will send high-level representatives. Wang confirmed Philippine President Rodrigo Duterte as one of the leaders coming, along with the Spanish, Greek, Hungarian, Serb and Polish prime ministers and Swiss and Czech presidents. “This is an economic cooperation forum, an international cooperation platform that everyone is paying attention to, supports and hopes to participate in,” Wang said. “One Belt, One Road is to date the most important public good China has given to the world, first proposed by China but for all countries to enjoy,” said. “The culture and historical genes of One Belt, One Road come from the old Silk Road, so it takes Eurasia as its main region,” he said, adding that representatives of 110 countries would attend the forum. A section of the New Silk Road is in Pakistan, where some projects run through the disputed Kashmir region. Wang dismissed concerns, saying the Pakistan project had no direct connection to the dispute and India was welcome to participate in the New Silk Road. “Indian friends have said to us that One Belt, One Road is a very good suggestion,” he said. 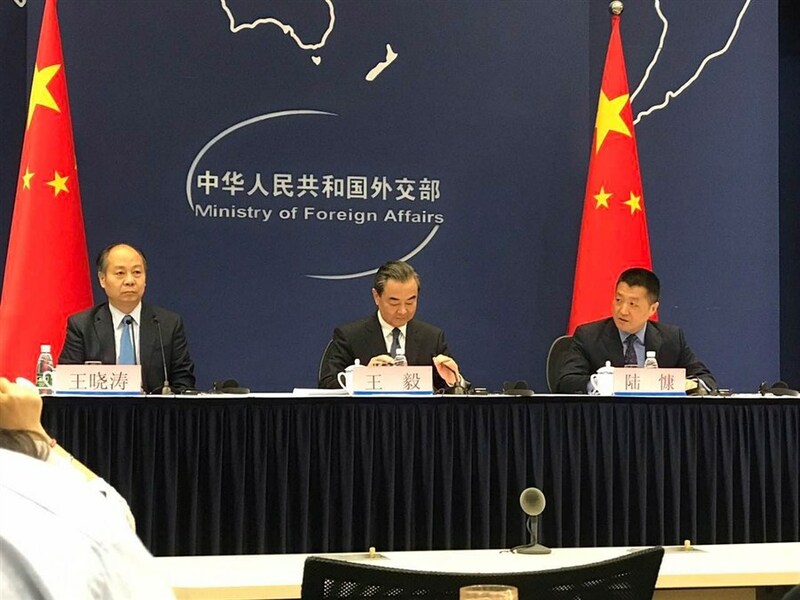 During the forum, China is expected to sign cooperative documents with nearly 20 countries and more than 20 international organizations, Wang told reporters. China will work with countries along the route on action plans concerning infrastructure, energy and resources, production capacity, trade and investment, which will help to turn the grand blueprint into a clear roadmap, he said. Another task of the forum will be to push forward delivery of cooperative projects, Wang said. During the forum, parties will identify major cooperative projects, set up working groups and establish an investment cooperation center. China will also work with all parties on a set of measures that will include improved financial cooperation, a cooperation platform for science, technology and environmental protection, and enhanced exchanges and training of talent. Participants will sign financing agreements to support their cooperative projects, Wang said. China will use the forum to build a more open and efficient international cooperation platform; a closer, stronger partnership network; and to push for a more just, reasonable and balanced international governance system, Wang said.